On Friday April 23, 2010, I received a question from Migrant Tales: besides the UN Declaration of Human Rights (UDHR), what are the other significant human rights instruments? Before I answer the question, permit me to shed some light on the UDHR. 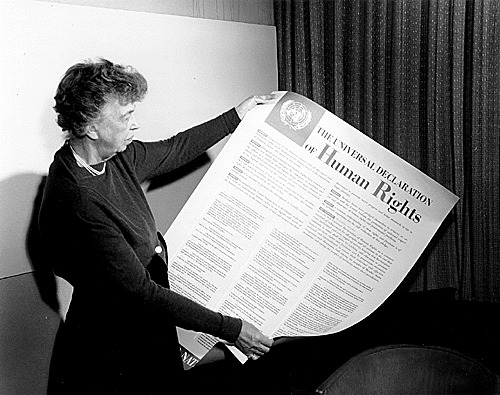 Following the Second World War and outrageous human rights violations that shocked mankind, such as the state-sponsored extermination of Jews by Nazi-Germany (holocaust), the United Nations General Assembly adopted the UDHR on December 1948. The Declaration was adopted partly in a bid to limit states violations of the inalienable rights of individuals. It is worth noting that the UDHR is merely a declaration, hence it is not legally binding on states. In a bid to make the rights laid down in the UDHR binding, other significant human rights instruments (conventions), which are legally binding on all states that ratify them, were adopted. The question at this point is - what are the other significant human rights instruments? International Covenant on Civil and Political Rights (ICCPR). It was adopted by the United Nations General Assembly on December 1966. The ICCPR is monitored the Human Rights Committee. Individuals within the borders of member states of the ICCPR can submit complaints of human rights violations to the Committee. International Covenant on Economic Social and Cultural Rights (ICESCR) - adopted by the United Nations General Assembly on December 1966. It is monitored by the United Nations Committee on Economic Social and Cultural Rights. Convention on the Elimination of All Forms of Discrimination Against Women (CEDAW) - adopted in December 1979. It is monitored by the Committee on the Elimination of Discrimination against Women. Convention Against Torture and Other Cruel, Inhuman and Degrading Treatment or Punishment (CAT), adopted on December 1984. It is monitored by the Committee against Torture. Convention on the Elimination of all Forms of Racial Discrimination (ICERD), adopted in December 1965. The Convention is monitored by the Committee on the Elimination of Racial Discrimination. Convention on the Rights of the Child (CRC), adopted by the United Nations General Assembly on November 1989. It is monitored by the Committee on the Rights of the Child. International Convention on the Protection of the Rights of All Migrant Workers and Members of their Families. * It was adopted in 1990 and came into force on July 2003. The Convention is monitored by the Committee on Migrant Workers. Forced Labour Convention, adopted by the General Conference of the International Labour Organization, in June 1930. Freedom of Association and Protection of the Right to Organise Convention, 1948. Right to Organise and Collective Bargaining Convention, 1949. Abolition of Forced Labour Convention, adopted in June 1957. Worst Forms of Child Labour Convention, 1999. Significant regional human rights instruments include. African Charter on Human and Peoples' Rights. It is overseen by the African Commission on Human and Peoples' Rights. European Convention on Human Rights, drafted in November 1950 in Rome. American Convention on Human Rights, adopted by adopted by countries in the Americas in 1969. No doubt - the 1949 Geneva Conventions are also significant human rights instruments. While it is true that the above list of human rights instruments is far from being exhaustive - it is also true that the list contains the significant human rights instruments that are often invoked. * I hope my [cyberspace] friend - columnist and blogger at Migrant Tales can "push" Finland to ratify the International Convention on the Protection of the Rights of All Migrant Workers and Members of their Families. Follow his blog - Migrant Tales.